Heat Shrink Tubing | Electrical Insulation Tubing | Cal Fasteners, Inc.
Heat shrink tubing is the shrinkable plastic tubing used to insulate solid and stranded wires; it also provides abrasion, vibration, resistance, and corrosion protection for wires, conductors, connections, and terminals in electrical engineering. 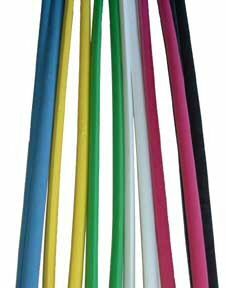 Cal Fasteners offers heat shrink tubing in a variety of durable materials and in various colors for wire identification, color-coding, etc. Adhesive liners melt and flow to better seal and encapsulate components. Our heat shrink tubing is available in 6-foot and 12-foot lengths, and in 100-foot rolls. We offer heat shrink tubing in the standard 3:1 ratio, as well as 2:1 ratio for special applications. Request a quote on heat shrink tubing for your project, or contact Cal Fasteners to learn more.